“Gus Van Sant’s Don’t Worry, He Won’t Get Far on Foot is a biopic of the late Oregon cartoonist John Callahan, which is to say it’s a movie about a quadriplegic, a tortured artist and a recovering alcoholic. 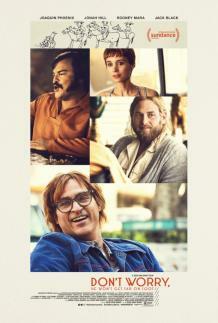 The film offers glimpses of a younger, ambulatory Callahan (Joaquin Phoenix), a hard drinker since his teenage years; the devastating 1972 car accident that severed his spine and put him in a wheelchair for the rest of his life; the rock-bottom despair that pushed him into Alcoholics Anonymous and a difficult journey toward sobriety and renewal. Much of the movie, with its artfully scrambled chronology and clear emotional throughlines, seems to be structured around Callahan’s steady progression through the 12 steps.